I ducked into the hoophouse today to check on things and warm up a bit. We're waiting on a part for our new woodstove, and so the house is chilly. A little work in there seemed like a good choice. Once inside I found it was a balmy 65 degrees and climbing. Everything looked great although it was a bit dry. There is a fair amount of condensation on the plastic, but it isn't enough to really water the plants. I did a little watering and planted a nice little row of bok choi seeds. They should germinate, but we'll see how quickly they actually grow in these short hours of daylight. 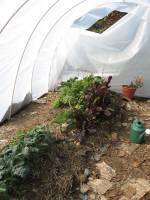 Then it was a little weeding, and plucking cabbage worms off the kale and calabrese plants. No sign of the praying mantis, but there was a lovely little ladybug wandering around. While in many ways I had been more than ready for the garden to be done, I am so glad we have the hoophouse. Not only is it a cozy spot, but we have a ready supply of tasty greens and herbs. The beets seem to be coming along nicely, and once we finish working on the adjacent bed I'm going to put in some more kale, transplant some volunteer lettuce, and see what else I can try my hand at.